Attack of the Frozen Things! In the Paul Auster-scripted film Smoke (1995), William Hurt recounts an anecdote about an alpine skier who is caught in an avalanche and lost, presumed dead. His son grows up and he also becomes a skier and one day, while out skiing, he finds a body frozen in the ice. At first he thinks he is looking into a mirror but then he realises he is seeing his father’s body, his father who is now a younger man than he is. The frozen parent has the power of a parable, illustrating the curious paradox of our travelling through time and outliving that which came before. What is disconcerting in the story is the fact that the father has stopped time travelling and so allowed his son to overtake him. The uncanny nature of the frozen is a commonplace in science fiction. As in Auster’s story, the frozen is never genuinely dead so much as stopped/suspended. In H.P. Lovecraft’s novella from 1936, At the Mountains of Madness, an expedition to the Antarctic uncovers the remains of a prehistoric race of monstrous life forms, the Elder Things. One of the recovered specimens comes alive and wreaks havoc. The horror plays on the anxiety caused by the theory of evolution. Older civilisations have ruled the earth and will rule again. Humans are just a temporarily dominant species without a permanent foothold and with no particular claim, or purpose. It was partly to direct the film version of the Lovecraft story that Guillermo del Toro eventually passed on The Hobbit (announced for 2012). Lovecraft has had an unhappy relationship with the cinema. Mined by Roger Corman once Edgar Allan Poe had run dry, or schlocked up by Brian Yuzna and Stuart Gordon for films like Re-Animator (1985), perhaps he will receive a more serious approach from del Toro. Although how exactly del Toro will render the ten-foot-tall blind penguins that inhabit the underground city without veering into camp remains to be seen. For Lovecraft, the frozen represents an ancient other, an attack of the old on the young. To add to the sense that we are doomed comes the additional horror of realising it was ever so; our destruction was simply waiting for us to uncover it. This idea is borrowed in Steven Spielberg’s War of the Worlds (2005) remake, which somewhat implausibly insists that the alien machines were already buried, frozen, thousands of years ago, ready only to be activated and piloted at the moment of invasion. As in Lovecraft’s story, John W. Campbell’s novella Who Goes There? is also set in Antarctica and features a scientific expedition going badly wrong. Campbell’s story is an extreme exercise in group psychology. The isolation of the setting and the hostility of the environment ramps up the tension, as a shape-changing alien frozen in the ice hundreds of thousands of years earlier is defrosted and comes to life. The ancient and alien other for Lovecraft represented a blow to humanity’s ignorant self-importance, but the Thing challenges the very notions of identity and the integrity of the self. The men discuss their predicament with clarity. If the Thing copies you perfectly, including your thoughts and prayers, your memory and your knowledge, how would it be different from you, the men ask. Would you even know you had been copied? Ostensibly an adaptation of Campbell’s novella, Howard Hawks’s The Thing from another World (1951) jettisons much of this discussion and reduces the angst-ridden paranoia with a far safer and more straightforward fear of the other. The Thing is a lumbering Frankenstein’s monster, unchanging, safely malignant and freshly alien (he’s just crash-landed the night before). Partaking of a post-Hiroshima distrust of science, the mad (or at least deluded) scientist is seen as being as much of a threat as the creature he seeks wrong-headedly to protect. Rather than the full-throated anxiety and cannibalistic madness of the original story, Hawks’s Americans are a can-do citizen army of practical solutions, replete with a quick-fire banter lifted straight from the screwball tradition exemplified by Hawks’s own His Girl Friday (1940). There is a racy romance in the offing and the beanpole journalist says ‘Holy cat!’ far too often. Even the way the alien is defrosted is framed like a joke: an electric blanket is mistakenly left on the block of ice containing the alien. The nascent Cold War allows for no internal divisions and Hawks’s army are a loose and relaxed set of chums, with the exception of the scientific party, but even there the scientist is conveniently dispatched by the monster. The captain himself is the opposite of Campbell’s anguished Garry and is content to follow the best ideas of his men rather than ordering and inspiring (or indeed leading) himself. John Carpenter’s The Thing (1982) is a far more faithful rendering of the original story, restoring the paranoia, the mutating alien and the names of the characters from Campbell’s version. There are no quipping girlfriends. The captain is despised, the men are all dysfunctional and get on each other’s nerves before the intrusion of the other even takes place. The Thing is now once more the ancient Lovecraftian creature, frozen in ice for thousands of years. Its indeterminacy is, as one of the characters points out, a possible result of its history. It has adapted to so many forms on so many planets that we never see it as itself. Even in its monstrous manifestations it could simply be replaying a copied enemy, complete with tentacles and jaws, claws and what not. Rather than the ‘intellectual carrot’ of Hawks’s version or the blue-skinned three-eyed monster of Campbell’s, we never see the creature actually frozen in the ice. Carpenter’s film is preceded by the attack and massacre of the Norwegian base. The Thing we first see is a dog. 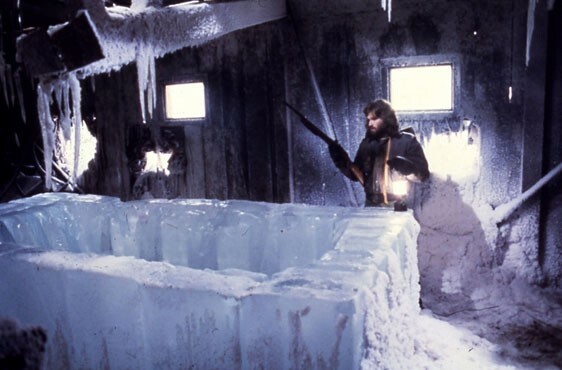 Its original history as a frozen artefact is discovered after the fact by MacReady (Kurt Russell) when he discovers a sarcophagus of ice at the deserted Norwegian base. Whereas the ending of Hawks’s film issues a call for vigilance which is essentially optimistic, leaving the characters and the audience forewarned and steeled to any coming conflict, Carpenter poses a hopeless and paranoid dilemma. Is MacReady or Childs the Thing? Or are they both? Or are neither of them (this obviously being the least satisfying)? Thankfully the projected sequel to Carpenter’s film has never been made, although a prequel (relating what happened to the Norwegians) is currently in post-production. The only happy ending we can imagine for the Carpenter film is that they both die without further contact with other people, thus averting an apocalypse. Of course, given that the creature has already survived freezing and given the nature of the frozen generally in science fiction films, it is more than likely that the creature has already won. As the most famous frozen dad of film, Jack Torrance in The Shining (1980), reminds us, for something that is frozen it is only a matter of time.